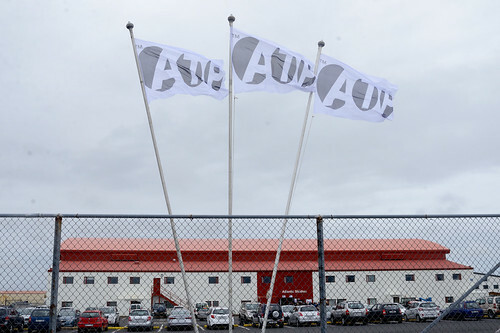 Now in its third year in Iceland, All Tomorrow's Parties returned Thursday to the former NATO U.S. Air Base Ásbrú in Keflavík. 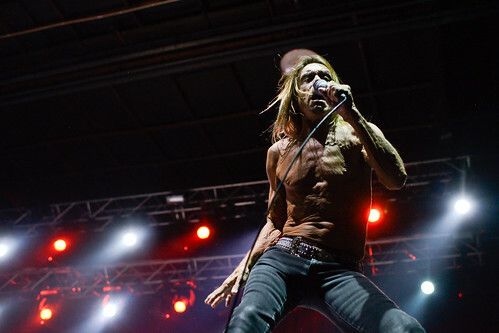 Music lovers from around the world came for the weekend's killer lineup, including Iggy Pop, Public Enemy, Belle & Sebastian, Swans, Godspeed You! Black Emperor, and local favorites like Kippi Kaninus and Grísalappalísa. Tons of well dressed Europeans (and a few Americans in the know) flock to this quiet region, just 45 minutes from the capitol city of Reykjavík. This magical festival fosters a spirit of intimacy between attendees and musicians: what backstage there is seems small, and artists are prone to hang out in the main crowd, showing their support for other acts. The crowds are fluid and friendly, and it's fairly easy to get up close, even for huge acts, because nearly everyone steps outside between acts for a smoke or some fresh air, and there's less of an attitude of entitlement over your "spot." Read on for some of the best moments from Day One, and check back throughout the weekend for our coverage of the rest of the festival. One such act was Public Enemy, playing their first ever show in Iceland. 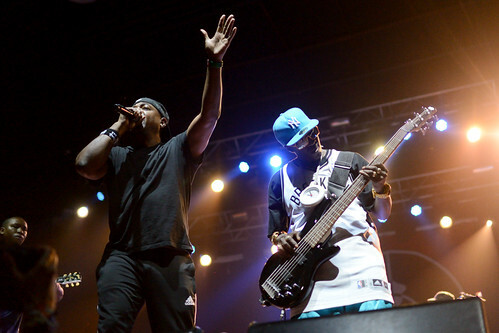 Frontmen Chuck D and Flavor Flav were ecstatic, jumping around the stage and calling out, "Iceland!!!" to great applause. Flavor Flav (who received overwhelming cheers when he revealed his quintessential clock necklace) even let the crowd in on a personal joy, saying his sixth grandchild had just been born. He joked, "Not many grandfathers can do what I'm about to do. Just watch." He also mentioned their recent induction into the Rock and Roll Hall of Fame, making them only the fourth hip hop group to be honored. The two were joined by their own DJ Lord (Terminator X's replacement after his motorcycle accident of 1994) and a group of dancers and hype men in army fatigues. The nod at the former NATO base was clear, but it felt whimsical rather than heavy. Favorites included "Don't Believe the Hype," "31 Flavors," "Rebel Without a Pause," and "911 is a Joke." They debuted new song, "Man Plans God Laughs," from their forthcoming album of the same name. 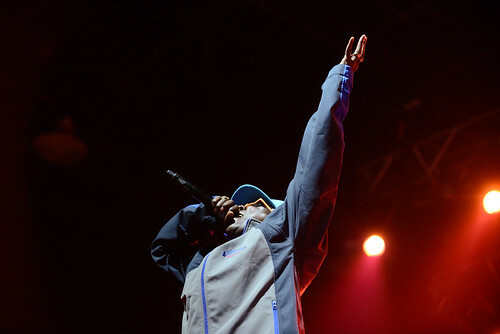 They were one group who stuck around to support others, and Flavor Flav was seen on stage saying hello to the crowd before Run the Jewel's set later that night. 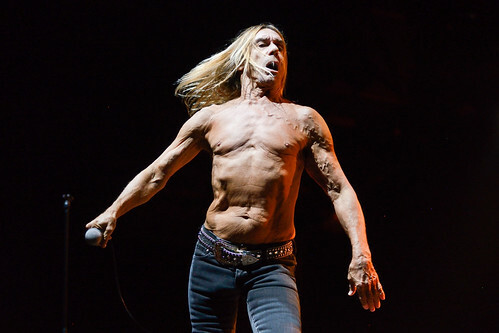 Last night, Iggy Pop put everyone to shame who's ever sat out due to age. Blowing through a full set of classics from his most popular albums Lust for Life and The Idiot, the 68-year-old punk innovator sauntered around the stage, blowing kisses to fans, dousing himself in water, and leaning languidly on stacks of amps. The NATO/military context came up again, as he prefaced "1969" from The Stooges with, "When I was a little boy they wanted me to fight in a war. I didn't wanna fight in no war. I wanted to make loooooove. Just like it was 1969." The crowd cheered, expressing an obvious distaste of war, as Iceland has never had an army of its own, and is an extremely peaceful nation. 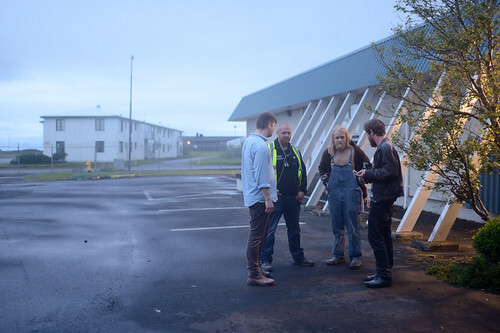 The U.S.'s presence at the NATO base was technically an invasion, but there was a silver lining: Americans brought Rock and Roll to Iceland (the subsequent unfolding of Icelandic rock is immortalized in a museum in nearby Keflavík). Fans went wild for famous tracks "The Passenger," and "Lust for Life," but the real winners were tracks from The Idiot. For moody track "Sister Midnight," Pop brought out a chair from side stage, reclining on it lazily, singing from his back and smacking the mic against his sinewy chest. 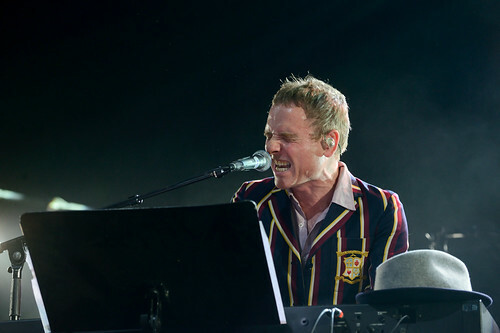 As the track progressed, he sat up and eventually stood, thrashing around, throwing the chair across the stage. "Mass Production" was deep and powerful, a discordant number with dark lyrics and a repetitive melody. The beating bass and guitar chords lengthen, eventually breaking down to long intervals, punctuated by silence. This fog horn effect was fantastic, with Pop slamming his mic onto the ground and slowly walking off stage to the apocalyptic notes. But that wasn't the end, as he returned for two more, "I'm Bored" and "Fun Time." The set ended on a sweet note, with an earnest Pop saying, "We're not perfect, but maybe we're perfect for you!" Pop did an amazing job, delivering a performance that still shows up even today's punks. San Francisco's Deafheaven blew ATP away with their black metal shoegaze, passionately rocking out in the pitch black of the main stage. The stage is within the large hangar of Atlantic Studios, a first class film studio facility on the former base. The large room is painted completely black, and makes for a spectacular location for a concert. 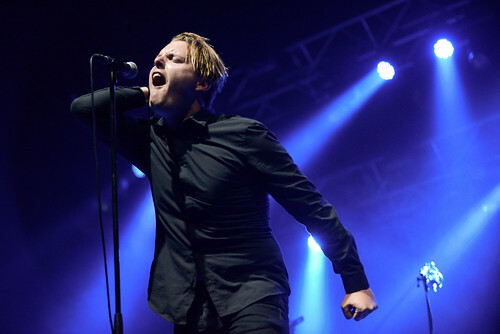 Deafheaven's frontman George Clarke was super charismatic, sweating profusely as he strained to sing the intense notes. He pointed his fingers and waved his arms to the crescendos of the music, resembling a symphony's conductor or even a crazed ballerina. The crowd sung along at the top of their lungs, as the notes rose and fell. The band dedicated their set to fellow performers and friends Chelsea Wolfe, ending on the track "Unrequited" from their 2011 debut Roads to Judah. 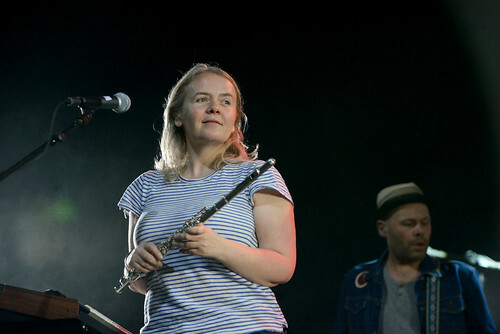 Scottish indie pop band Belle and Sebastian followed Iggy Pop, bringing the mood back up to light and fun, without losing any of the former's stage charm. Singer Stuart Murdoch has a great rapport with the crowd, speaking candidly about people in the room, current events, and the surrounding area. For their song, "Perfect Couples," from this year's new album Girls in Peacetime Want to Dance, Murdoch wove the festival into his spiel. He spoke about those couples you know who are great for each other, but who end up breaking up, and how it's happening "all around the world, in London, in Hollywood, maybe even in Reykjavík." He continued, "They disagree about everything, like which Pop album is their favorite. Raw Power, The Idiot, Lust for Life." The crowd laughed and the show went on. Awesome classics like "I'm A Cuckoo" and "Dog on Wheels" were woven between new tracks like "Nobody's Empire" and "The Party Line." 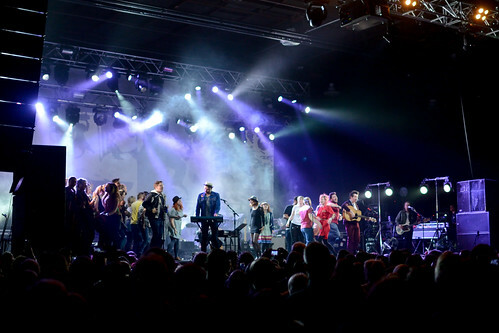 The band have had a string of tour dates recently, during many of which they have pulled crowd members onto stage to dance for the last two songs. ATP was no exception, and they ran a video of a beautiful woman saying, "You know, it's actually quite easy to get on stage with this band. Just dance your heart out, try to get noticed, and they'll surely pick you!" Murdoch encouraged them to keep their energy up during "The Boy with the Arab Strap," and all turned to lights and colors for the closing track "Legal Man." 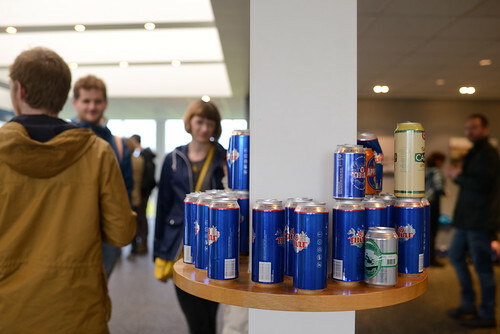 Icelanders are big beer drinkers. Throughout the day, the various piles of discarded cans grew and grew. At one point, there was so much beer being delivered to the bar that cases were just being dumped in the middle of the floor and haphazardly organized by the bartenders. By the end of the night, the floor of the main stage was coated with cans, and festival goers were jolly and having a blast. For a few this meant over indulgence, such as a woman during Belle and Sebastian's set who tried standing up for ten minutes before finally succeeding. 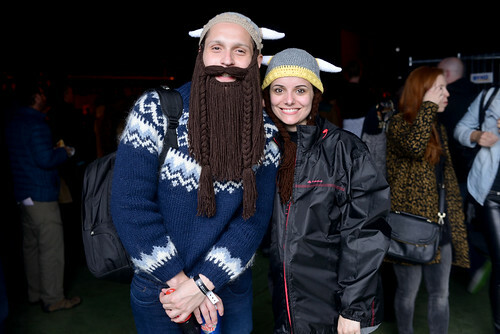 But for many, chugging beers just meant staying warm in the northern mist and celebrating the great music of the evening. After a full day of great music, we checked out the Officers Club for the late night dance party and ATP DJs. The tunes were grooving, the drinks were flowing, and everyone was having a great time dancing after a long day of shows. We were about half an hour in, and a tall, blonde, very Scandinavian-looking man in blue overalls and no shirt was killing it on the dance floor, dancing with everyone. He seemed to be "on" something, because at one point, we saw him staring directly into the lighting rig which was projecting shapes onto the ceiling. He disappeared for awhile and we kept on dancing. 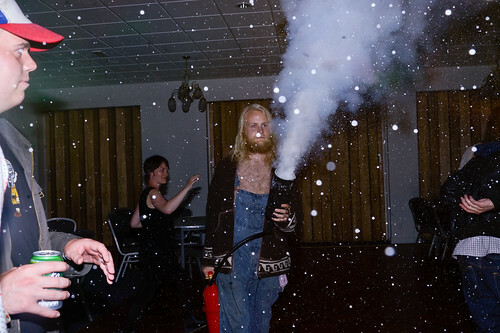 After some time passed, he reappeared with a fire extinguisher, and lit it off briefly on the dance floor! Everyone laughed in surprise and went with it, including the DJ who didn’t make any announcement to stop. The dancing crowd settled back down, believing it to be over, but five minutes later, it was going off again! The same guy had come back for more. It was all fun and games until we realized he was blasting it. He pointed it at the ceiling and it rained down on all sides, covering everyone in a chemical foam. People coughed and sputtered, scattering. Everyone ran outside, and eventually the perpetrator was seen being given a stern talking to. The dance music would have been one of the best parts of the day, but it was a bit harder to enjoy while hacking up chemicals. Never a dull moment at ATP!